Immediate and 30-minute post-biopsy CT scans showed air in the left ventricle, root, and descending aorta. A small left-sided pneumothorax was also detected (Figures 1 and 2). Interestingly, air bubbles were also found in the small mesenteric arteries and a small splenic infarct was noted as well (Figure 3). A CT scan of the patient’s head did not reveal any abnormality. Echocardiogram and contrast-enhanced CT examinations within the next 24 hours confirmed complete resolution of air in the left ventricle and aorta (Figure 4). 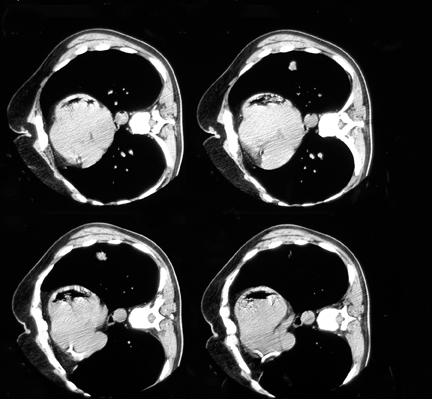 There was no change in size of the pneumothorax on repeating CT scans (Figure 4). Histopathology of biopsy material showed primary lung adenocarcinoma. Air embolism, the entry of gas into the vascular system, could be an iatrogenic problem following invasive procedures, such as cardiac surgery and neurosurgery, percutaneous biopsies, or central vascular catheterization, or following accidental trauma, such as chest trauma or pulmonary barotrauma in diving operations. The effects of air emboli differ greatly depending on their size, whether they are venous or arterial, and on the organ where they ultimately lodge. Arterial gas embolism can happen when air bubbles blow directly to the pulmonary veins through lung procedures.2 This seems to have been the cause of air embolism in this patient’s case, as there was no air detected in the right side of the heart on a CT scan performed immediately after the procedure. The fact that the patient was in the right lateral position during the procedure might have prevented the large amount of air from entering the left ventricular outflow tract; hence, decreasing the chance of distal artery emboli lodgment. Moreover, being in the head-down position immediately after diagnosis prevented air from entering the cerebral vasculature. As a result, unlike the recent recommendations to place patients with arterial gas embolism in the supine position,3,5 the head down, laterally lying position was helpful in our case. Depending on the amount of gas, a coronary air embolism could cause temporary ischemia of the myocardium, infarction, short hypertensive crisis, ventricular fibrillation and/or other dysrhythmias, cardiac failure, and cardiac arrest.5 Although a retrospective review of the postprocedure CT scan did not reveal air in the coronary arteries, the presence of air in the root and descending parts of aorta, transient ischemic changes on EKG, and mild cardiac enzyme elevation without any obliterative thrombus on coronary angiogram test made coronary artery air embolism the primary cause of this patient’s symptoms. 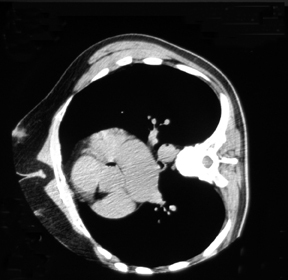 Diagnosing air embolism as a complication of lung biopsy is based on a good clinical suspicion and detection of air on a postprocedure CT scan. 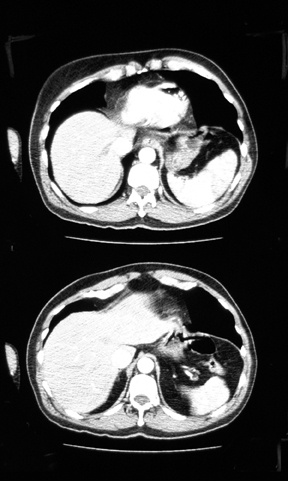 However, pathologic changes are sometimes very subtle and not well visualized on CT. Magnetic resonance imaging (MRI) and single photon emission computer tomography (SPECT) have been attempted to detect cerebral air embolisms (CAE), but a review study conducted by Elliott and Moon in 1996, concluded that clinical evaluation and CT are still preferred for the assessment of CAE. Treatment of air embolism consists of basic life support, high-flow oxygen (often with the aid of a ventilator), and IV fluid therapy.2,5 It has been shown that the left lateral decubitus position in venous/right ventricular air embolism redistributes the air above the right ventricular outflow tract, relieving air lock and improving survival.7 In our patient we found that right lateral positioning in left ventricular/arterial air embolism is effective in the same way. The benefits of corticosteroids, anticoagulants or lignocaine in air embolism are not yet confirmed. For arterial gas embolism, hyperbaric oxygen is the treatment of choice, as soon as cardiopulmonary stabilization has been achieved.5,8 This reduces bubble size by producing a diffusion gradient for oxygen into the bubble and for nitrogen out of the bubble.3 That was not available in our service, so only high-flow oxygen was applied. Air embolism is a rare but serious complication of percutaneous lung biopsy, which has high mortality and morbidity rates.Early detection, aggressive supportive treatment, and hyperbaric oxygen will reduce adverse outcomes. Positioning the patient in a way that air remains higher than the root of the vessel in the ventricle seems to be an important factor in managing these patients. Prevention could be achieved by selecting the shortest possible needle track through the lung, performing biopsy while the patient is in full inspiration, and occlusion of the needle end when the stylet is taken off. Manhire AR, Richardson, CM, Gleeson, FV. Lung biopsy guidelines. Thorax. 2003;58:913-914. Vanhulst RA, Klein J, Lachmann B. Gas embolism: Pathophysiology and treatment. Clin. Physiol. Funct. Imaging. 2003;23:237-246. Mansour A, AbdeRaouf S, et al. Acute coronary artery air embolism following CT-guided lung biopsy. Cardiovascular Interventional Radiology. 2005;28:131-134. Shetty PG, Fatterpekar F, et al. Fatal cerebral air embolism as a complication of trans-bronchoscopic lung biopsy. Australasian Radiology. 2001;45:215-217. Muth M, Shank C, Eric S. Primary care: Gas embolism. New Eng J Med. 2000;342:276-282. Faer MJ, Messerschmidt GL. Nonfatal pulmonary air embolism: Radiographic demonstration. AJR Am J Roentgenol. 1978;131:705-706. Chakaravarti R, Singh V, Isaac, R, John MJ. Fatal paradoxical pulmonary air embolism complicating percutaneous computed tomography-guided needle biopsy of the lung. Australasian Radiology. 2004;48:204-206. Aurora T, Ward KR, Garza R, Rivers E. Iatrogenic venous air embolism. J Emerg Med. 2000;18: 255-256. 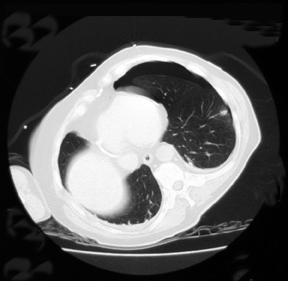 Iatrogenic air embolism following CT-guided lung biopsy. Appl Radiol.